blogging | Run. Work. Live. Repeat. Last week a friend of mine and blogger, Caolan MacMahon (www.ChronicRunner.com), nominated me to participate in a “blog hop.” The idea behind the “hop” is to tell people more about your writing style, who you are, why you write and then pay it forward by nominating two more bloggers in your post. Since I haven’t been blogging as much for a while now but needed motivation I said “yes” to her offer. Below are my answers along with nominations. Pictured above: Caolan MacMahon, who nominated me for this blog hop. My life has changed a lot since I first start this blog. For starters I changed the name from “Boston or Botox?” to “Run. Work. Live. Repeat.” to reflect who I am today. I’m still a mom, runner and writer, but as of last month I started grad school. I am pursuing my master’s degree in education and a license to become an English teacher, secondary education. I’m writing a lot of papers for school and I’ve learned to use Jing to create videos and oral presentations. I still blog on occasion. (I’m using this prod to get me more regular at it again.) I also continue to write on my own – mostly essays and short stories, and I’ve returned to writing a novel I’ve had in the works. When I’m not focused on school work or creative writing I spend time with my family or run. I’m training for the California International Marathon in December and currently averaging about 50 miles of running each week. 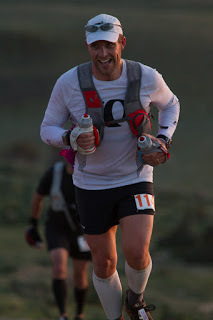 I started this blog after being published in the Runner’s World Other Voices blog. My original essay was “Boston or Botox? Beating Midlife with 42 Kilometers for 42 Years.” It’s a humor piece about how I became a marathoner and pursed a Boston Marathon qualifying time in my 40s. After it was published I started a running blog with the same name, “Boston or Botox?” I recently renamed it “Run. Work. Live. Repeat” because it was time for both me and writing to expand. I was a print journalist and now I’m becoming a writer and a teacher. 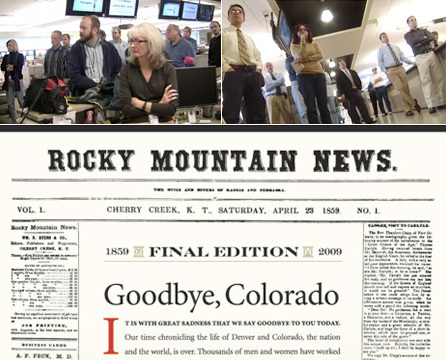 A screenshot of The Rocky Mountain News from Salon.com. I used to work for The Rocky. The newspaper folded in February 2009. My writing background: Journalism, pre-digital era. I am a former presentation editor for The (Denver) Rocky Mountain News. I graduated from Indiana University (Ernie Pyle School of Journalism) and I was trained as an old school print journalist so my blog started out more column-like with essays compared to other bloggers. 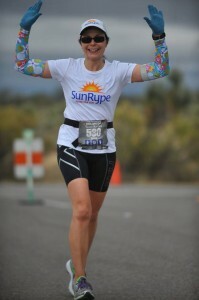 My focus was midlife inspiration through running, especially marathons and how Boston had become a hot commodity for midlife women runners (ages 40+). 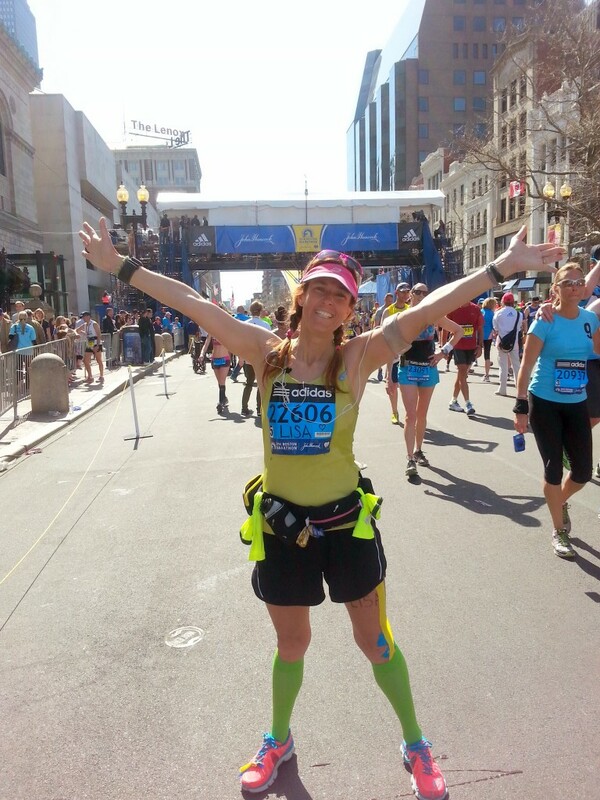 I did a series of Boston Marathon profiles and that’s how I met Caolan — I wrote about her. (I’m thinking of bringing back those profiles, along side with those of midlife men who’ve qualified for Boston.). Writing those profiles was a lot of fun and I made some great friendships through them. I’ve also written about my training and juggling motherhood. I’ve chronicled my children’s growth (“Tarzan and Jane”) and my own personal growth and reflections, too. When I ran the Boston Marathon in 2011 I got to write about it. My Boston Marathon experience felt like being Bon Jovi in running shoes for 26.2 (or what I imagine he must feel like giving a concert). The energy was amazing — once in a life. The people of Boston welcome marathoners each Patriots’ Day with opened arms and I’ve never experienced anything quite like it since. My Boston Marathon race bib, which was signed by Kathrine Switzer — the first woman to run and finish the Boston Marathon wearing an official race bib. She did it in 1967. I write because I love writing and it’s always been a part of me. I’ve always had an offbeat, creative streak, even when I was a kid. When I got to high school, I signed up for a journalism class the first semester of my freshman year and I took to it like a duck to water. I loved everything about journalism clases right away – reporting, writing, photography, layout and design. Back then it was done on paper; we used typewriters and pica poles and proportion wheels for scaling photos. I was good at it, too. By the time I was a senior I was the managing editor of my high school newspaper. The summer before I graduated I was nominated by my journalism teacher, Mrs. Gillard, to go to high school journalism institute at Indiana University. At that time, IU was among the top 10 journalism programs in the country. My experience that week sealed the deal. The next year I started journalism school at IU. By the time I graduated and left Bloomington, Indiana four years later I had completed a double major in journalism and Germanic Studies. After college I worked both in newspapers (The Santa Fe New Mexican, The Rocky Mountain News) and in Corporate America (a teacher editor at Los Alamos National Laboratory and Hewlett-Packard). I’ve also worked as a marketing copywriter for a website design and SEO company for the last few years. The process I use depends on the type of writing I am doing. For example, with my school work or at a job, I schedule time into my calendar and work during those time slots to meet my deadlines. This keeps me from procrastinating. If I’m blogging or creative writing, my process is more organic. I tend to go with the flow and write when creative inspiration hits me. Sometimes it takes a half hour to do; other times I will write for hours, absorbed in the creativity with the characters or scenes I’m creating or in the essays or stories that I am writing. I keep what I call a “dog bones” file. When I get an idea but don’t have the time to flesh it out, I jot down the idea as a snippet of paper and bury it for later. Then when I have more time I go back to the idea and work on it. Lately I have started to schedule time into my day to work on the novel because otherwise, it’s easy for me to set it down and not get back to it. I think writing and the process of writing is much running and marathon training. You often get what you put into it and if you want to get better at it, you need to be consistent, not give up, and work hard at improving. My blog hop nominations are Ryan Anderson, http://ryan-in-boise.blogspot.com/ and Lisa Roehn-Gensel, http://mom2marathon.com/blog/. Ryan, who lives in Boise, Idaho, is an incredible runner who lost 135 pounds in 11 months in his fitness journey before becoming a marathoner. He then became a Boston qualifier and an ultrarunner. We met through the Dailymile.com. 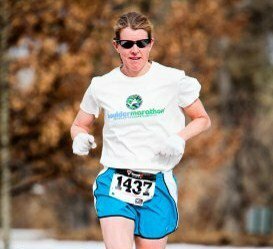 Lisa, who lives in Fort Collins, Colorado, is also a marathoner who qualified for Boston around the same time that I did (a few years back). She didn’t start running until after she had kids and turned 40. She and I met through mutual friends. Both Ryan and Lisa are inspirational runners and bloggers and I think you’ll enjoy their stories so I encourage you to visit their blogs, too. Keep up the great work, Lisa and Ryan, and I look forward to your blog hops, too.